Ask a GH (grown-up helper) to pre-heat a panini press. In a small bowl, mix the cheese and ranch dressing and spread on the cut side of the roll tops. Cover the sandwiches with the roll tops and ask your GH to place in the panini press. Cook for 3-4 minutes, then cut in half and serve with the veggie sticks. In Recipes-list.com we have selected the most viewed recipes from category - uncategorized . Enjoy the best recipes specially selected for you! 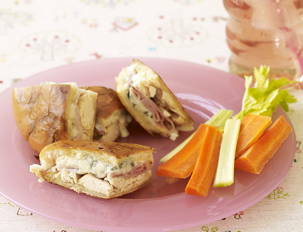 Chicken Cordon “Blue” Panini is the right choice that will satisfy all your claims.